Walk-in for an interview: Walk-out with a job! Somers Town Medical Centre is part of the AT Medics group, London’s largest Primary Care Provider, with a strong reputation for high quality patient care and investing in people. On Saturday 9th March 2019, we are hosting a recruitment fair for a number of amazing Administrator and Receptionist roles available across our North West and Central London GP practices. Come and meet our team if you are looking for a bright future serving NHS patients in London. This is a great time for individuals seeking a fulfilling and interactive role to join us. You will join a family dedicated to serving over 260,000 patients across London, and we will invest in your continued professional development through structured learning programmes and career pathways. Not only will you be exposed to exciting workflows and projects within our GP surgeries, giving you variety in your role, but there is also the opportunity to grow into management and leadership roles. Are you looking to build a highly respectable career in healthcare management? Are you determined and passionate about contributing and making a difference? If so, then AT Medics can provide the fundamental foundation and a career pathway for you to realise this goal. Perhaps you are an experienced administrator or receptionist looking to develop further? Maybe you are a recent graduate who would like to start their career in healthcare? Or perhaps you are looking for a change in the career? No matter what background you’re coming from, so long as you have a desire and the passion to make a change, we are willing to invest in you. If this role is appealing to you, why not walk-in for an interview and walk-out with a job. 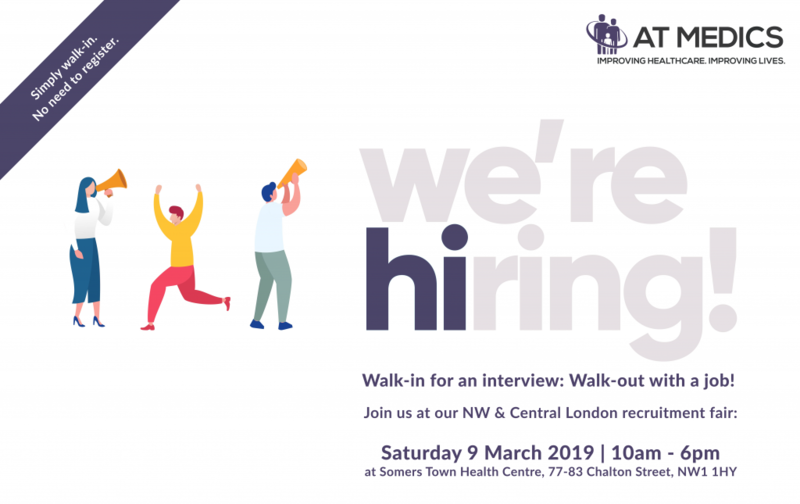 The recruitment fair will be held on the Saturday 9th March 2019 at Somers Town Medical Centre, 77-83 Chalton Street, London, NW1 1HY. This is a walk-in jobs fair and no appointment is necessary. Candidates shall be attended to on a first come, first served basis using waiting tickets. Early attendance is highly recommended.